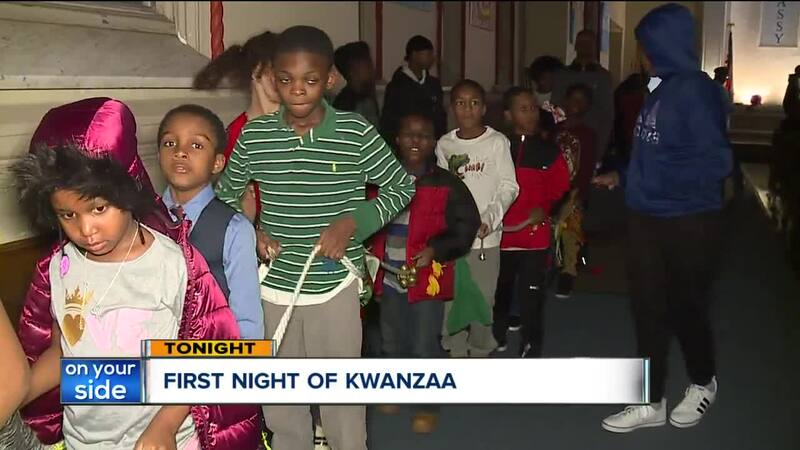 CLEVELAND — Dozens of people piled into the pews at the Holy Trinity Cultural Arts Center on Wednesday to celebrate umoja---or unity, the first principal of Kwanzaa. As the seven day holiday continues, a new principal will be the focus. Like on the second night, they'll celebrate kujichagulia or self determination, the fifth night, Nia which means purpose and on the final night imani or faith. "Kwanzaa was started back in the 60s by a doctor who wanted to teach us to love each other more," said Elaine Barclay Jones. Jones is one of the organizers of the Kwanzaa event that's been going strong for decades. She says the holiday is also about celebrating African-American culture. "Our people were so disenfranchised, though everything that we've been through starting with slavery but to learn to love each other, to learn to unite to come together," she said. One of the most important parts of Kwanzaa is the table. Everything from the mat to the candles to the corn symbolizes something special. "I just thought that it would be great to have my family come out with me and just celebrate in honor of our ancestors," said Kendall Michelle. It's Kendall's first time celebrating Kwanzaa. "When I came across Kwanzaa and I understood it was really a holiday made for our people," she said. "I was like I want to do something that's meaningful and speed joy, spread unity." She says it won't be her last. "Even though Kwanzaa is great for the seven principals, take that wherever you go," said Kendall. "You know, and just make that apart of you because every day you get up, you have a new beginning a new start to be something better."